Sparrow hills – the highest viewing point in the city, located on the hill of Moscow river and right next to one of the Soviet skyscrapers – famous Moscow State University. Victory park – the main Great Patriotic War Memorial in the grounds of ex- Soviet Union with a memorial obelisk dedicated to the victory, Triumphal Arch over Napoleon, the longest alley of fountains and World War II Museum, as well as open air exhibition of military equipment and fortification of the times of the war. 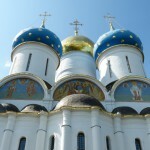 Cathedral of Christ the Savior – the greatest Cathedral in Russia built in 1883 with a very tragic history. Patriarch Bridge – a photo stop at the pedestrian bridge with a breathtaking view to Moscow Kremlin, Cathedral of Christ the Savior and statue of Peter the Great. Manege Square – the largest square of the city with historical, modern and Soviet architecture in one place just a few minute walk away from Kremlin and Red Square. 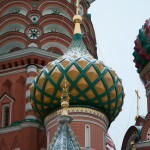 Red Square – the central and most visited square of the country. St Basil Cathedral – a gorgeous cathedral that was built in the middle of the 16th century to commemorate our victory over Kazan and the main symbol of Russia. Tomb of Lenin – the mausoleum of Soviet Communist leader – Vladimir Lenin where until now he rests in peace. GUM department store – a beautiful historical shopping mall in the heart of the city. The Bolshoy Theater – one of the world’s famous stages for opera and ballet performances. KGB headquarters – a legendary building on famous Lubyanka Square that is still in operation nowadays.